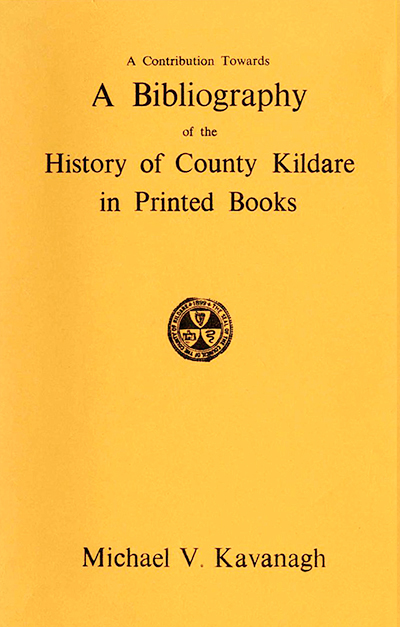 Kavanagh's bibliography was a comprehensive list of books and periodicals on the history of County Kildare at the time of its publication in 1977. Tips for searching: enter an author's name, title or subject. the search facility will look for an exact match for your search term in all fields in the database. This resource was made possible through the support of the Heritage Council and the Local Studies department of the Library & Arts Service of Kildare County Council. Many years of painstaking research and work came to a climax in Hotel Keadeen on Friday when Mr. M. Kavanagh, assistant Librarian at Newbridge, launched his new reference book; A Contribution Towards a Bibliography of Co. Kildare. Friday's launching function was sponsored by the Bank of Ireland, and the author presented a copy of the book to Mrs. Patsy Lawlor, Co.C., who is Chairman of the Co. Library Committee. The attendance at the function was very representative, and tributes were paid to the author. Mr. Kavanagh is native of Ashford, Co. Wicklow, and work on the bibliography really began a number of years ago when he started on the systematic listing of detail relating to the religious and civil history of Co. Kildare as well as other aspects of social life, etc., in the county. In 1970 he submitted the first part in the form of a thesis for his Fellowship of the Library Association of Ireland, an honour he was awarded in 1972. Since then he had been working on the completion of the book; in the course of this he spent many hours gathering data in libraries in Dublin, Maynooth and elsewhere. Indeed, he left no stone unturned in tracing and utilising any reliable source of information for the work, a truly monumental task. It had been planned that the publication would coincide with the publication of a history of the County Library service over the past fifty years complied by County Librarian Mr. Seamus O Conchubhair but this was delayed and will be published later. Many tributes were paid to author Kavanagh on Friday night and there was also praise and appreciation for those who had helped in the work including Commdt. Con Costello, Hon. Editor of the Journal of Co. Kildare Archaeological Society; Rev. Seán Corkery, former Maynooth College Librarian; Rev. B. Egan, Killinery; Mr. John Cooke, Newbridge; Mr. Frank Driver, Ballymore; Major P. N.N. Synott, Naas; Miss Maud Wolfe, and the librarians and staff of the National Library and of the Longford Westmeath County Library. Mr. Kavanagh's work is being published by Kildare Co. Council and in address at Friday's function Co. Manager Mr. J. G. Ward said it was planned to extend the library service to include a music section, information on Government publications, and other innovations.